On September 8, 1974, President Gerald Ford granted Richard Nixon a “full, free and absolute” pardon for any crimes he may have committed while in office, and the future of the United States was forever changed. It signaled the beginning of a new relationship between the country and its citizens. It is difficult to imagine it could have been any worse if the country had endured a trial that would have been contentious. It is easy to believe it could have been better than the inherent distrust now felt by many citizens. Some may disagree, but a brief look at the quotations of other presidents reveals that no other has so many pronouncements attributed to him that speak negatively about the institution and the public servants who carry on the business of the country he promised to lead. In the more than three decades since he took office, his policies of deregulation and taxation have brought this once powerful country to the brink of destruction. Taking his election to a second term as a signal he should continue his assault, he noted his commitment to the same destructive principles in his second inaugural address delivered on January 21, 1985 (http://www.bartleby.com/124/pres62.html). 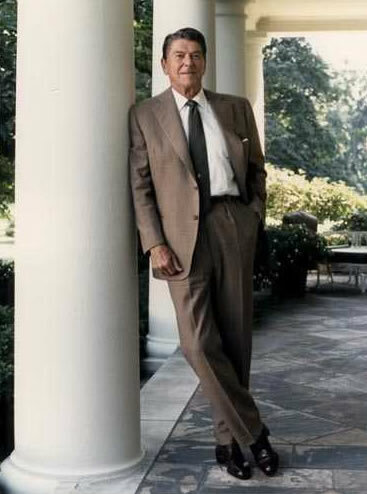 He observed, “We have begun to increase the rewards for work, savings, and investment; reduce the increase in the cost and size of government and its interference in people’s lives.” Again, the federal government was cast as the “bad guy,” and Reagan was unrelenting as he continued to eat away at our respect for the government we had created. Unless bureaucracy is constantly resisted, it breaks down representative government and overwhelms democracy. The fact is, bureaucracies are a problem around the world. Extreme taxation, excessive controls, oppressive government competition with business, frustrated minorities and forgotten Americans are not the products of free enterprise. They are the residue of centralized bureaucracy, of government by a self-anointed elite. And I have to point out that government doesn’t tax to get the money it needs, government always needs the money it gets. There’s a clear cause and effect here that is as neat and predictable as a law of physics: As government expands, liberty contracts. Nations crumble from within when the citizenry asks of government those things which the citizenry might better provide for itself. … [I] hope we have once again reminded people that man is not free unless government is limited. I’m convinced that today the majority of Americans want what those first Americans wanted: A better life for themselves and their children; a minimum of government authority. The best view of big government is in the rear view mirror as we leave it behind. He ended his presidency the same way he had begun it. In his farewell speech of January 11, 1989 (http://www.presidency.ucsb.edu/ws/?pid=29650), he reiterated his distaste of the government when he said, “I hope we once again have reminded people that man is not free unless government is limited. Now, it seems, we cannot free ourselves from his terrible legacy. Posted in Federal, Government, Patriotism, Presidents by Randee Head with no comments yet.